This great modern yet elegant professional designed laptop sleeve safeguards your laptop and accessories from any unwanted bumps, scrapes and knocks, which may result in damage to your device. It can be perfectly used for both business and leisure, stylish and decent in appearance, you will be delighted with our bag. Constructed with a modern slim and lightweight design to accommodate daily use and protection needs. Sleeve design that can easily slide and fit into a larger backpack, briefcase, messenger bag, other protective bags, or protective enough to be carried alone. The durable sleeve features inner foam cushions to protect your tablet/laptop against dust, scratches, drops, and shocks.Made of waterproof and splash-proof Canvas fabric. Don't worry about wet from splashing water or rain. Double layer design: There is a separate computer pocket on the first floor, using a soft plush material, can well protect the computer; On the other floor there is a mesh bag that can be easily used as a power adapter, tablet computer, mouse, etc. There is also a separate pocket design for mobile phones, notebooks, mobile power, data cables, etc. 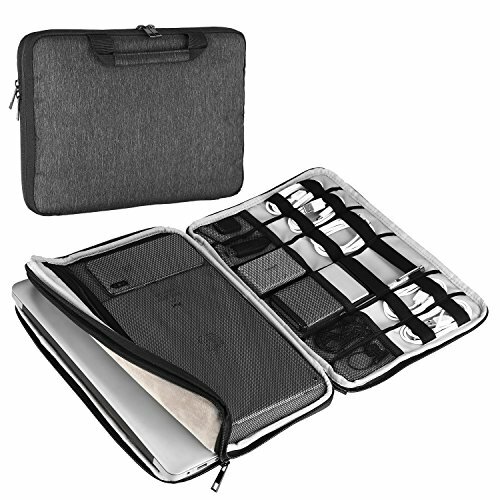 Double zippers can open pockets as needed:This organizer case helps you to sort and store your items because of the different compartments and pockets. It is great for being able to see all your items and keeping them in order. The design of the case allows you easy to get them in and out of.You can take it on a long trip. If you have any questions about this product by Devmlicor, contact us by completing and submitting the form below. If you are looking for a specif part number, please include it with your message.